As a mom to school aged children I am always looking for fun and EASY school treats. It is an added bonus if the treat is “school” themed especially for back to school. 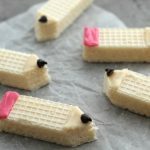 That is why these back to school pencil cookies are PERFECT for any class party, but especially as a treat at the beginning of the school year. Who would think about making school supplies into a treat!! Such a great idea and pencils are one of the biggest supplies needed. 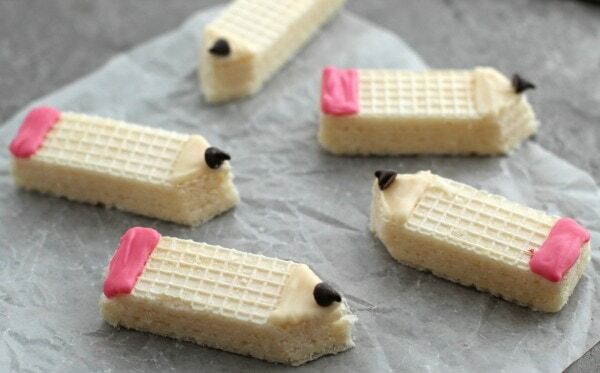 If the school doesn't want treats sent the first week of school…a platter of back to school pencil cookies would be great for giving to the teacher or even the whole staff! These are so quick to make that you could do it in no time. Using a serrated knife , carefully cut the squared corners off of one side of each wafer cookie so they are in the shape of a point at one end. I like to cut all of the cookies at once and my kids usually eat the tips, LOL! 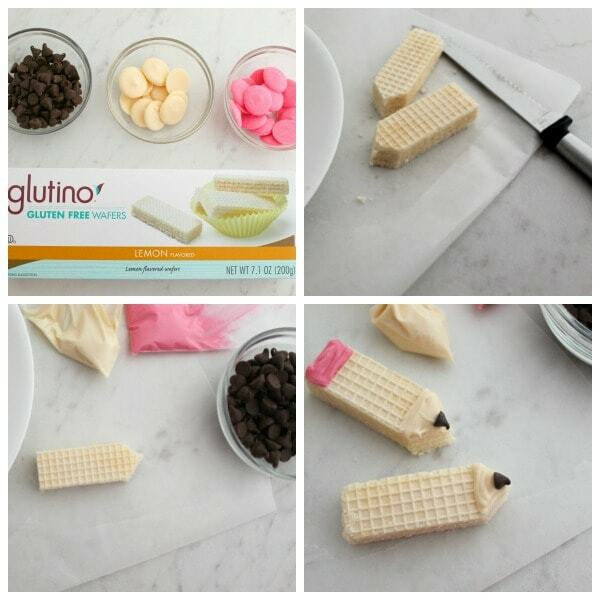 Melt the white and pink chocolate according to package directions. Depending on how many pencil cookies you plan to make will determine how much chocolate to melt. I usually only melt a little bit to reduce waste! Scoop each color of melting chocolate into its own sandwich bag or pastry bag. Press the chocolate all the way until it reaches the bottom of one corner of the sandwich bag. Use scissors to snip off a very small tip to allow the chocolate to slowly flow through. If you use a pastry bag just use a piping tip . Use the white melting chocolate to draw around the edge of the triangle tip of each wafer cookie to create the “pencil tip”. Fill in the triangle in with the chocolate. Place a chocolate chip on the very end (point facing out) so it looks like the pencil tip! 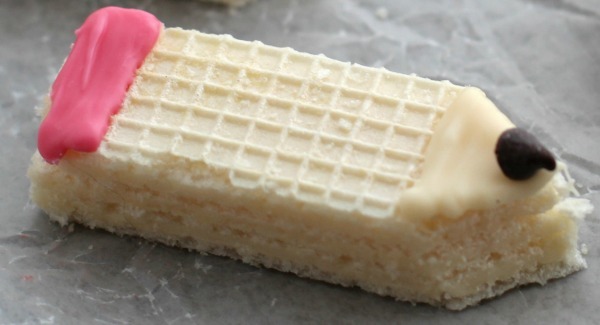 Use the pink melting chocolate to trace around the opposite squared end of the wafer cookie , and completely fill in a rectangular shape with the pink melting chocolate to create the “eraser” end of the pencil. Complete this process for all the cookies. Let the melting chocolate cool completely before you eat them. 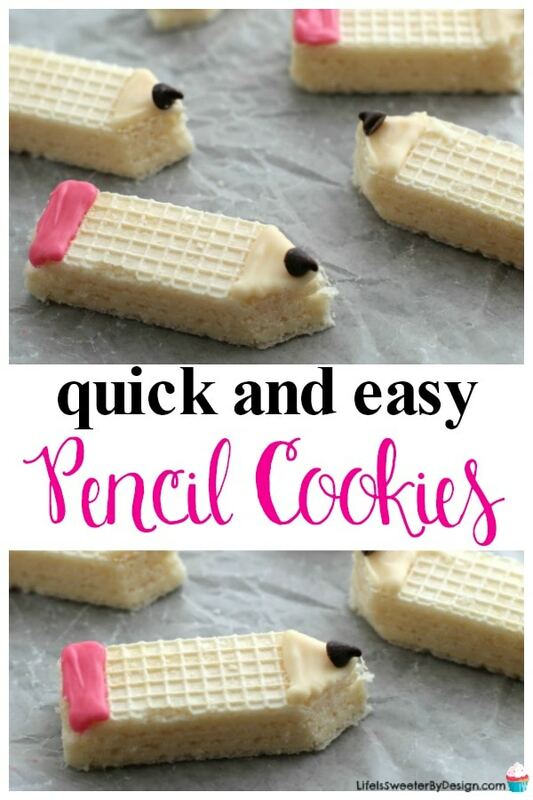 Arrange the back to school pencil cookies on a platter or in a covered container for storing. What are You Doing for Back to School? What are you prepping for back to school time? I am already working on our first day of school photo ideas! Let me know who you are making the pencil cookies for!! 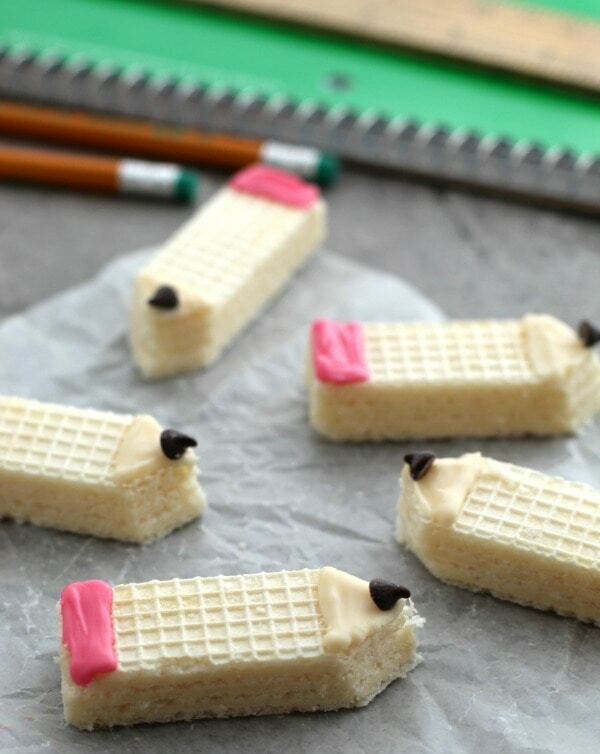 Pencils cookies for back to school are a fun treat idea. This quick and easy school treat will make kids smile! Using a serrated knife, carefully cut the squared corners off of one side of each wafer cookie so they are in the shape of a point at one end. Melt the white and pink chocolate according to package directions. Depending on how many pencil cookies you plan to make will determine how much chocolate to melt. Scoop each color of melting chocolate into its own sandwich bag or pastry bag. Press the chocolate all the way until it reaches the bottom of one corner of the sandwich bag. Use scissors to snip off a very small tip to allow the chocolate to slowly flow through. If you use a pastry bag just use a piping tip. Use the pink melting chocolate to trace around the opposite squared end of the wafer cookie, and completely fill in a rectangular shape with the pink melting chocolate to create the “eraser” end of the pencil. Use mini chocolate chips for smaller cookies.